Nathan P. Gilmour , 23 May 2013. Certain writers linger at the borders of certain disciplines, and I always feel somewhat bad for neglecting them. Thus in 2009 Michial and I read through Heidegger’s Being and Time, and in the summer of 2012 I finally took on Kenneth Burke’s Grammar of Motives and Rhetoric of Motives. 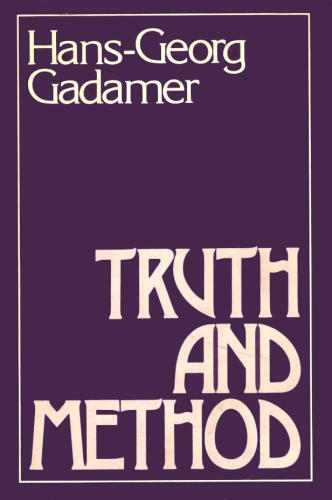 This summer, Michial and I have agreed to try blogging through another book that seems often to show up as a predecessor-figure, Hans-Georg Gadamer’s Truth and Method. If Heidegger shows up in the footnotes of existential and ethical philosophy books and Burke in rhetorical tomes, Gadamer is the once-deferred presence in books about interpretation, whether of Biblical texts or Shakespearean tragedies. Named by Philip Cary (in a lecture that I attended) as one of the “conservative postmodernists” who pose a counter-tradition to Derrida and the “radical postmodernists”, Gadamer was someone I had wanted to read for some time, and in the spring, Michial and I decided that we’d both read and attempt to blog through this book this summer. We will be using the edition of Gadamer from the link above, but our posts will take on roughly one section of the book at a time for those following along in other editions. Thus I present the first section of Truth and Method. Gadamer begins Truth and Method with an intellectual problem and turns to history to start to solve it. The big question with which the book starts is whether the humanities and social sciences, or the “moral sciences” as John Stuart Mill called them (3), have their own particular logic or whether they would do best to appropriate and adopt the modes of reasoning with which the physical sciences make sense of particles and magnetic fields and astronomic motion. Before getting too far at all Gadamer suggests that historicism, the situation of realities relative to their place in cultural and political development across time, should be the methodological signature of the human sciences in the same way that mechanism, the practice of treating reality as a series of machines of various complexity, governs the physical sciences (6). For the humanist, then, one of the most helpful conceptual developments of modern philosophy is Hegel’s notion of Bildung. Recoving the classical and medieval notion of human nature as dynamic from an Enlightenment tradition that tended to flatten the same, Hegel notes that the time-conditioned capacity to “break with the immediate and the natural” (12) and to entertain greater and greater degrees of abstraction from immediate sensory perception. Bildung, like Aristotle’s intellectual virtues, develop with time and practice; nobody is born able to reason as well as that same person could do so after disciplined education. For such an enterprise, memory is not simply one mental faculty among many but constitutive of existence (16). To remember not only the trees and food that one senses but the texts and lectures as well means that the moves that one makes as a human being are always moves in response to remembered reality, and the character of existence as commentary on memory (not unlike Alasdair MacIntyre’s notion of a tradition) makes education not merely training and certainly not the collection of random facts for the sake of collecting facts but giving shape to future horizons of act. Gadamer notes that, in the Italian Enlightenment figure of Giambattista Vico, the tradition of rhetorical phronesis (practical wisdom) as a counterpart to philosophical sophia (theoretical wisdom) continues the work of the Renaissance as a counterbalance to the strong separation between (natural) philosophy and (decorative) rhetoric that the Enlightenment, following the lead of Francis Bacon, tends to posit. Thus in Vico’s vision of education the formation of memory, not the discovery of new facts, is at the core of education, and rhetoric itself represents not merely the “communication” of knowledge but a body of knowledge in its own right (21). Thus Vico stands against Northern European models of education which would make all education “scientific” in a narrowly experimental/mathematical sense, insisting that Cicero’s project of vita memoriae, the training of memory through immersion in historical learning (23). As opposed to German “scientific” histories, Vico holds on to the conviction that history is an inherently rhetorical, moral practice (24). Two traditions, each mixing the ethical and the epistemological, follow in the wake of the German Enlightenment’s insistence upon separating the theoretical from the practical, the Italian tendency to keep them as parts of a larger pedagogical whole, and Hegel’s attempt to bring both of them into one grand system. (Hegel did love some grand systems.) On one hand Gadamer investigates the Scottish Enlightenment concept of Common Sense; on the other the Stoical (and by inheritance Romantic) tradition of sensus communis. At first glance, the two seem to be merely translations, one for the other. But in the Scottish tradition, Common Sense means that all material reality, and by extension the social relationships that derive their forms from material reality, stands as uniformly accessible to the five senses of all able human beings. Thus the “sense” that one person gets is “common” to all. This philosophy rises up largely as a response to the radical skepticism of David Hume, who noted that nothing beyond direct sensory impressions are really available to the mind, that a concept as simple as the cause-effect relationship between two bodies in motion (the most famous example being two balls on a pool table) is not actually itself apprehensible by sensory perception and thus is not the subject of real knowledge. Thomas Reid, the most famous of the Common-Sense school, retorts in a witty essay that Hume himself only submitted his manuscript to the publisher because he believed that the event (submission of manuscript) would result in a predictable response (paycheck). Thus, for Reid and all the heirs of Common Sense Realism, the whole of our “everyday” existence is, by and large, transparent, allowing us to see “through” such things as cause and effect and on into the content of what the causes and effects are. Where people differ, either one party is mistaken (seeing a red billiard ball when the ball is actually green) or simply differ in opinion (red billiard balls are prettier than green billiard balls). Taste is just as real a function of “perception” as seeing number, smelling sulfur, or hearing a bell ring. Taste can be certain of the goodness or badness of a thing, even if reasons are not readily available to explain the evaluation (26). Taste results from education; it is not an inherent capacity in undisciplined human beings. Gadamer notes that Plato and Aristotle both basically agree that taste is something that develops, that the pleasures of the uneducated human being are of one sort and those of the educated person are of a different and better sort (40). Although the German Enlightenment tradition, including its high point Kant, dismisses taste as the core of ethical philosophy (40), the Romantics recover it, differing from ethical sentimentalists in insisting, along with the ancients, that the proper moral dispositions are not the result of mere duration as a human being but become better- or worse-attuned to the truth of good and bad by means of good or bad education. At this point, nearing the 1500-word mark, I’m going to hand it over to Michial, who in our next post will take on the next section of Truth and Method, which will expand on taste and explore the connections between taste and experience. (a) Gadamer’s topic seems as relevant as ever, maybe even more so than when he was writing. The sciences have been advancing on the humanities for at least a century, but now, with the reign of neurobiology and the rise of technology-based humanisms, the moment for Gadamer’s defense of the distinctiveness of the humanities may well have arrived. (b) The concept of bildung seems to me to have major echoes in Alasdair MacIntyre’s virtue ethics. Is there a sense in which bildung is the exercise of particular kinds of virtue in relation to some more-or-less universal practice? (c) The division between common sense and sensus communis is interesting because, while the former is connected with the Scottish Enlightenment and its radical empiricism, Gadamer’s description of the latter sounds very close indeed to Humean sentimentalist ethics! Did the rest of the Scots just read Hume wrong, or am I missing something in my own understanding of moral sense theory? MichialFarmer I could have been reading Gadamer’s section on sensus communis and Common Sense wrong, now that I think of it. He could have been describing two sides of the same coin. That said, he does seem to trace sensus communis back to the Stoics while he locates Common Sense firmly in the modern period. Did you get the same impression, or did I miss something?